MALAYSIAN palm oil stocks probably tumbled 13.3 per cent in December from a record the month before, as a low output cycle gathered pace and exports rose, a Reuters poll showed today. Inventories in the world’s second largest producer of the vegetable oil eased to 1.97 million tonnes from a record 2.27 million tonnes in November, according to a median estimate of five plantation houses, the first dip in four months. Output fell 9.6 per cent to 1.50 million tonnes in December, the lowest in six months, which poll contributors also attributed to heavy rains which disrupted some harvesting in key palm growing areas in central and eastern Malaysia. Shipments likely jumped 20.7 per cent to 1.63 million tonnes as China stepped up buying ahead of the Chinese New Year festival at the end of this month. “The last two years have seen some good production growth but finally a combination of the low production cycle and heavy rains knocked down stock levels,” said a contributor to the poll. La Nina, or “little girl” in Spanish, refers to an unusual cooling of sea surface temperatures in the Pacific Ocean which tends to bring increased wet weather to Southeast Asia. Coupled with government efforts to bring down stock levels through replanting schemes and biofuel mandates, palm oil inventories could reach 1.5 million tonnes within the next six months, plantation officials said. “Everything seems to be coming together in terms of managing stock levels and prices, plantation firms have been reducing fertiliser use since November and that affects yields,” said an official from a leading plantation house. Palm oil futures have bounced about 40 per cent since the October 28 low of RM1,331, prompting big buyers in Asia and Europe to snap up shipments before prices go any higher. “China is buying normally for Chinese New Year while India and Pakistan are taking on shipments that were deferred earlier on,” said another poll respondent. However, slowing global economic growth will keep the outlook for exports cloudy in the coming months as buying for the Asian festival season starting in September will only kick off in May or June. The Reuters poll also showed that Malaysia in December probably imported 50,000 tonnes of mostly crude palm oil from top producer Indonesia. MUMBAI, Jan 8 (Reuters) - India soybean futures may trade lower on Thursday tracking a slide in U.S. soybean and Malaysian palm, analysts said. India, which imports a large part of its edible oil requirement, tracks international prices. At 9:11 a.m. March futures KPOH9 on the Bursa Malaysia Derivatives Exchange were down 3.68 percent at 1,912 ringgit a tonne. NCDEX February soybean NSBG9 ended at 2,055.50 rupees per 100 kg, down 0.15 percent in the previous session, while February rapeseed NRSG9 ended at 514.10 rupees per 20 kg, up 0.64 percent. MUMBAI, Jan 8 (Reuters) - Indian soyoil futures fell on Thursday as traders booked profits from a recent run up after cheaper crude oil triggered losses in U.S. soyoil and Malaysian palm oil futures. Lower spot soyoil prices also weighed. At 3:00 p.m. (0930 GMT), the January futures contract NSOF9 on India's National Commodity and Derivatives Exchange was down 0.59 percent at 491.25 rupees ($10.1) per 10 kg. February futures NSOG9 had fallen 0.66 percent to 478.50 rupees, after piling on more than 8 percent in last week. "Soyoil futures are forecast to trade on a weaker note on account of long liquidation supported by weak overseas market," brokerage Karvy Comtrade Ltd, said in a report. Spot prices of crude soyoil in the central city of Indore, a hub for the soyoil trade, fell 0.45 percent to 44,700 rupees per tonne. A sharp overnight fall in crude oil CLc1 prices weighed on global markets, analysts said. Soyoil is used as biofuel and a fall in crude oil prices lowers demand for alternative fuels. At 3:01 p.m. March futures KPOH9 on the Bursa Malaysia Derivatives Exchange were down 4.58 percent at 1,894 ringgit a tonne. U.S. soyoil March futures BOH9 were down 1.69 percent at 35.57 cents per pound during the electronic trade on Thursday. Jan. 8 (Bloomberg) -- Gold rose the most in a week as the dollar dropped, boosting demand for the precious metal as an alternative investment. Platinum also gained. The dollar fell as much as 1.3 percent against a weighted basket of six major currencies. Gold and other precious metals generally move in the opposite direction of the U.S. currency. Last year, gold rose the least since 2004 as the dollar advanced for the first time since 2005. Gold futures for February delivery rose $12.80, or 1.5 percent, to $854.40 an ounce on the Comex division of the New York Mercantile Exchange, the biggest gain for a most-active contract since Dec. 31. Platinum futures for April delivery rose $4.50, or 0.5 percent, to $994.60 an ounce on the Nymex. Palladium futures for March delivery dropped $2.35, or 1.2 percent, to $198.20 an ounce. Silver futures for March delivery were little changed at $11.097 an ounce on the Comex. Some investors may prefer gold to currencies as central banks around the world cut borrowing costs to stimulate growth, analysts said. The Bank of England cut its benchmark lending rate to an all-time low of 1.5 percent. The European Central Bank’s rate is at 2.5 percent, while the Federal Reserve has slashed its main rate to zero to 0.25 percent. Last year, gold gained 5.5 percent. Gold priced in euros climbed 10 percent and gold priced in pounds jumped 44 percent. Platinum, palladium and silver, which have wider industrial applications than gold, may trail the yellow metal should the recession deepen and asset prices continue to fall. Excluding gold, all metals posted losses in 2008. Initial jobless claims unexpectedly fell by 24,000 to 467,000 in the week that ended Jan. 3, the lowest level in almost three months, the Labor Department said today. The total number of people getting benefits rose a week earlier to 4.6 million, the most since 1982. A U.S. payroll report tomorrow may show the economy lost jobs every month in 2008 and the unemployment rate reached a 16- year high in December, according to a Bloomberg survey of economists. “It looks like deflation might be holding on as a theme,” Hartmann said. Jan. 8 (Bloomberg) -- Crude oil fell for a third day as the rising number of jobless workers in the U.S. intensified concern that the recession will cut fuel use in the world’s biggest energy-consuming country. Oil dropped as much as 4.9 percent after a report showed that the number of people getting unemployment benefits surged to a 26-year high. The Labor Department tomorrow may say that the jobless rate climbed to 7 percent, a survey showed. U.S. oil stockpiles rose last week, the government said yesterday. Natural gas supplies declined less than forecast in a report today. Crude oil for February delivery fell 93 cents, or 2.2 percent, to settle at $41.70 a barrel at 2:44 p.m. on the New York Mercantile Exchange, the lowest since Dec. 30. Oil is down 57 percent from a year ago. The government may report tomorrow that the economy lost another 510,000 jobs in December, bringing the 2008 total to a six-decade high of 2.4 million, according to economists surveyed by Bloomberg News. Prices rose as much as 2.4 percent to $43.63 earlier today as rocket attacks on Israel launched from Lebanon spurred concern that the widening conflict in Gaza will disrupt Middle East supplies, and as Venezuela and Angola signaled compliance with the Organization of Petroleum Exporting Countries’ production cuts agreed to last month. Volume in electronic trading on the exchange was 537,132 contracts as of 3:24 p.m. in New York. Volume totaled 612,862 contracts yesterday, up 29 percent from the average over the past 3 months. Open interest yesterday was 1.22 million contracts. The exchange has a one-business-day delay in reporting open interest and full volume data. U.S. crude-oil inventories rose 6.68 million barrels to 325.4 million barrels last week, the Energy Department said yesterday in a weekly report. Supplies at Cushing, Oklahoma, where oil that’s traded on Nymex is stored, climbed 14 percent to 32.2 million barrels, the highest since at least April 2004, when the department began keeping track of supplies there. The price of oil for delivery in February 2010 is 44 percent more than for the current month, increasing the opportunity for traders to profit from storing crude for later use. This structure, in which the subsequent month’s price is higher than the one before it, is known as contango. Prices also fell on speculation that OAO Gazprom, Russia’s natural-gas exporter, will resume fuel shipments to Europe through Ukraine and because of the government report showing that U.S. natural-gas supplies dropped by less than expected. The flow of Russian gas will start as soon as international monitors are deployed, Chief Executive Officer Alexei Miller said. Ten gas-consuming nations have agreed to join a committee to monitor flows of Russian gas through Ukraine, Miller told reporters in Brussels today. U.S. supplies of natural gas, a competing fuel, declined 47 billion cubic feet to 2.83 trillion cubic feet last week, the Energy Department said today in Washington. Inventories were forecast to fall 78 billion cubic feet, according to a survey of analyst estimates compiled by Bloomberg News. Natural gas for February delivery fell 28.9 cents, or 4.9 percent, to settle at $5.583 per million British thermal units in New York. Brent crude oil for February settlement fell $1.19, or 2.6 percent, to settle at $44.67 a barrel on London’s ICE Futures Europe exchange. The price of Brent oil in London is $2.97 higher than crude traded in New York. The difference makes it profitable to divert oil from Africa, the Middle East and other sources to European ports. Profiting from the disparity in prices is known as arbitrage. “Given the arbitrage, any spare cargo of oil, such as what is now loading in Nigeria, is going to Europe,” Evans said. Jan. 9 (Bloomberg) -- The dollar headed for its first weekly loss against the yen in three weeks before a U.S. payroll report that may show the economy lost jobs every month in 2008 and the unemployment rate rose in December to a 16-year high. The yen was poised to snap a four-week losing streak versus the euro as declines in most global equity markets prompted investors to seek the perceived safety of Japan’s currency. The euro was set for second weekly drop against the British pound after the Bank of England cut interest rates yesterday. The dollar traded at 91.35 yen at 8:35 a.m. in Tokyo, after falling 1.6 percent yesterday and touching 90.85, the lowest since Jan. 2. The greenback was at $1.3694 per euro, following a 0.4 percent drop. Europe’s currency traded at 125.09 yen after declining 1.2 percent and touching 124.11, the lowest level since Dec. 22. The U.S. currency may weaken to 90 yen and $1.38 per euro today, Saito said. The Norwegian krone and the Mexican peso declined yesterday as crude oil dropped. The krone fell as much as 1.8 percent to 7.0238 per dollar, the biggest intraday drop since Dec. 26, and the peso retreated as much as 1.8 percent to 13.6897. Crude oil for February delivery declined 2.2 percent to $41.70 a barrel yesterday, following a 12 percent drop on Jan. 7. Norway is the world’s fifth-largest oil supplier, while Mexico ranks as the third-largest supplier of crude to the U.S.
Sterling traded at $1.5225 after the BOE lowered its main rate by half a percentage point, the fourth cut since global coordinated emergency reductions on Oct. 8. Against the euro, the pound gained 0.1 percent to 89.95 pence. It’s about 8 percent stronger since touching 98.029 pence on Dec. 30, the weakest since the euro’s 1999 debut. The yen rose 3.3 percent to 6.668 per Mexican peso and 1.3 percent to 9.4359 versus the South African rand yesterday on speculation investors will sell higher-yielding assets and pay back low-cost loans in Japan’s currency. The Bank of Japan’s 0.1 percent target lending rate compares with 8.25 percent in Mexico and 11.5 percent in South Africa. The Standard & Poor’s 500 Index of U.S. equities has fallen 2.4 percent this week, while the MSCI Asia-Pacific Index of regional shares is down 0.1 percent. Wal-Mart, the world’s biggest retail chain, said yesterday that fourth-quarter profit will be less than earlier forecast after sales at stores open at least a year rose 1.7 percent last month, missing analysts’ estimates. The U.S. unemployment rate likely jumped in December to 7 percent, the highest level since 1993, according to the median forecast of 70 analysts surveyed by Bloomberg News. Non-farm payrolls probably fell by 525,000 last month, according to the survey. The Labor Department is scheduled to release the data at 8:30 a.m. in Washington. The total number of people receiving unemployment benefits rose in the week ended Dec. 27 to 4.6 million, the most since 1982, the Labor Department said yesterday. Initial jobless claims fell to 467,000 in the week that ended Jan. 3. FKLI December contract close marginal 3 points lower at 918.5 as compare with previous trading session with a total of 6189 lots traded in the market. FKLI was open lower during trading session but mainly traded sideways throughout the entire trading session. 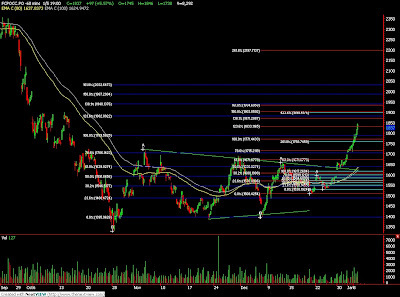 Technically, FKLI seems strong holding on 61.8% Fibonacci projection figures at 912 regions and manage to close on higher side on closing. We expect FKLI would trade lower in the coming trading session with resistance seen at 930 and 935 regions. Traders were advice to hold short position in the coming trading session provided resistances were not violated. Supports were seen at 900 and 865 region. FCPO February futures contract plunge RM120 lower compare to previous trading session and close at RM1865 with a total 10563 lots traded in the market. CPO price plunge due crude oil and soybean oil closed weak during overnight trading session. 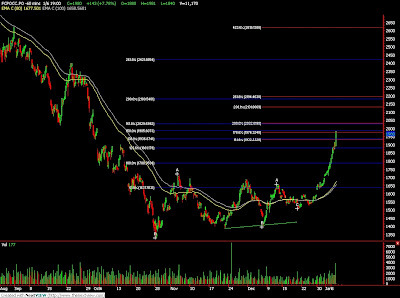 Technically, CPO price seem temporary supported above RM1860 region; 61.8% Fibonacci projection figures. 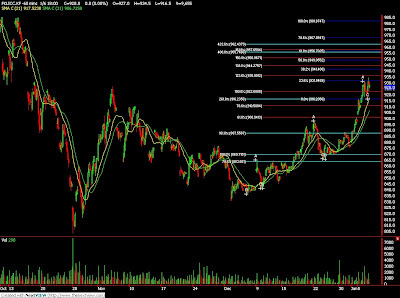 We expect CPO price would rebound mild around 50% and 61.8% Fibonacci retracement figures at RM1960 and RM1980 region. However, traders were advice to hold short position provided RM2015 levels were not violated. 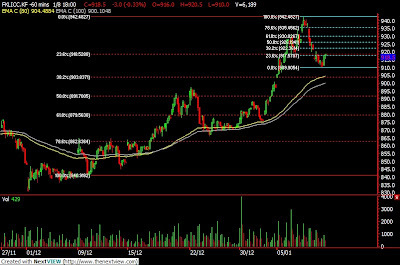 Supports were seen around RM1783 and RM1720 region; 50% and 61.8% Fibonacci retracement figures. Jan. 8 (Bloomberg) -- Oil futures dropped for a third day after a U.S. government report showed bigger-than-expected gains in supplies of crude, gasoline and distillate fuel as consumption dropped. Inventories of crude oil rose 6.68 million barrels to 325.4 million barrels last week, the highest since May, the Energy Department said yesterday in a weekly report. Supplies were forecast to increase by 800,000 barrels, according to the median of forecasts by 14 analysts in a Bloomberg News survey. Crude oil for February delivery fell as much as 39 cents, or 0.9 percent, to $42.24 a barrel on the New York Mercantile Exchange, and was at $42.37 at 7:48 a.m. Singapore time. Yesterday, futures dropped $5.95, or 12 percent, to $42.63 a barrel, the lowest settlement since Dec. 30. The decline was the biggest since Sept. 24, 2001. Futures on the exchange are down 55 percent from a year ago. Inventories at Cushing, Oklahoma, where oil that’s traded on Nymex is stored, climbed 14 percent to 32.2 million barrels last week, the highest since at least April 2004, when the department began keeping track of supplies there. The price of oil for delivery in February 2010 is 41 percent more than for the current month, increasing the opportunity for traders to profit. This structure, in which the subsequent month’s price is higher than the one before it, is known as contango. Contango trading encourages companies to increase stockpiles if they have available storage. Volume in electronic trading on the exchange was 535,890 contracts as of 3:05 p.m. in New York yesterday. Volume totaled 649,999 contracts on Jan. 6, up 38 percent from the average over the past 3 months. Open interest on Jan. 6 was 1.22 million contracts. The exchange has a one-business-day delay in reporting open interest and full volume data. Gasoline inventories rose 3.33 million barrels to 211.4 million barrels, the department said. Supplies were forecast to increase by 1 million barrels. Distillate supplies, which include heating oil and diesel, climbed 1.79 million barrels to 137.8 million barrels. A gain of 1.1 million barrels was forecast. Gasoline futures for February delivery dropped 11.28 cents, or 9.5 percent, to settle at $1.0764 a gallon in New York. Heating oil for February delivery fell 8.32 cents, or 5.1 percent, to end the session at $1.5431 a gallon. Regular gasoline at the pump, averaged nationwide, rose 3.9 cents to $1.727 a gallon, AAA, the largest U.S. motorist organization, said on its Web site today. It was the biggest one- day increase since September. Prices have dropped 58 percent from the record $4.114 a gallon reached on July 17. U.S. fuel consumption during the four weeks ended Jan. 2 averaged 20.1 million barrels a day, down 2.9 percent from a year earlier, the Energy Department report showed. Imports of crude oil increased 13 percent to 10.5 million barrels a day last week, the biggest one-week gain since the week ended Oct. 3, when the Gulf Coast was recovering from hurricanes Gustav and Ike. Refineries operated at 84.6 percent of capacity last week, up 2.1 percentage points from the week before, the report showed. Analysts forecast that there would be no change in utilization. Earlier this week, crude reached a five-week high on the conflict between Israel and Hamas in the Gaza Strip, Russia’s gas dispute with Ukraine, and signs that OPEC members are enacting supply cuts. It later fell as manufacturing data indicated the U.S. recession is deepening. Brent crude oil for February settlement declined $4.67, or 9.2 percent, to settle at $45.86 a barrel on London’s ICE Futures Europe exchange. Saudi Foreign Minister Prince Saud al-Faisal said oil “isn’t a weapon” to end fighting in the Middle East. Prince al- Faisal, speaking at a press conference in New York, said oil “can’t reverse a conflict,” when asked about an Iranian call for Arab states to stop producing as a means of putting pressure on countries backing Israel. Oil surged in 1974, helping spur a recession in the developed world, after an oil embargo that followed the Arab- Israeli war in October 1973. Frontline Ltd., the world’s biggest owner of supertankers, said oil traders want to charter as many as 10 vessels to hold crude to take advantage of higher prices later in the year. About 25 supertankers were already hired for storage and there are inquiries for 5 to 10 more, Jens Martin Jensen, Singapore-based interim chief executive officer of the company’s management unit, said by phone today. Jan. 8 (Bloomberg) -- The dollar may weaken a second day against the yen before U.S. government data forecast to show unemployment increased, reinforcing investor expectations for a protracted recession. The greenback may also decline for a second day versus the euro after a private report showed yesterday that U.S. employers cut more jobs in December than economists estimated. Australia’s currency may weaken after prices for commodities the country exports fell, suggesting corporate revenue will decline. The dollar traded at 92.66 yen at 8:23 a.m. in Tokyo, little changed from yesterday in New York. The dollar was at $1.3641 per euro from $1.3644. It touched $1.3313 on Jan. 6, the strongest level since Dec. 12. The euro traded at 126.39 yen from 126.42 yen. The dollar may weaken to 91.80 yen and $136.90 per euro today, Soma said. U.S. nonfarm payrolls fell 500,000 in December, bringing last year’s decline to 2.4 million, the most since 1945, according to a Bloomberg survey before Labor Department figures due tomorrow. The unemployment rate likely jumped to 7 percent, the highest level since 1993. Companies in the U.S. slashed 693,000 jobs in December, the most since records began in 2001, ADP Employer Services said yesterday. The median forecast of a Bloomberg News survey of 24 economists was for a reduction of 495,000. The Dollar Index on ICE futures, which tracks the greenback versus six major U.S. trading partners, fell 0.7 percent yesterday. The dollar’s tendency to rise as investors seek protection from stock-market declines is ending because economic growth is becoming the main driver for the U.S. currency, foreign-exchange strategists at BNP Paribas SA said. The dollar rallied 30 percent versus Brazil’s real and gained 4 percent against the euro last year as investors sought safety in U.S. Treasuries after the MSCI World stock index slumped 42 percent and writedowns and losses at the world’s largest financial institutions since the start of 2007 totaled $1 trillion. The rally stalled mid-December as investors sold Treasuries for higher-yielding assets elsewhere. The greenback has lost 7 percent against the New Zealand dollar, the Australian dollar and the South African rand since Dec. 15. Merrill Lynch & Co. recommended investors sell the euro versus the dollar through options, sell the pound versus the dollar and sell the euro versus the Swiss franc. The dollar will rise to $1.15 per euro by the end of March and appreciate to 58 cents versus the Aussie from 71 cents yesterday, according to the bank’s forecasts. The euro traded at 90.23 British pence from 90.35. It dropped to less than 90 pence yesterday for the first time since Dec. 17. It has lost 5.8 percent this year on speculation slowing inflation will give the European Central Bank room to cut interest rates to tackle a recession. The British currency slid 23 percent against the euro last year, its biggest annual drop since the common currency’s debut, as U.K. policy makers cut borrowing costs by more than the ECB as the British economy entered its first recession in 17 years. The Bank of England will lower its benchmark rate by half a percentage point to an all-time low of 1.5 percent when it announces a policy decision today, according to a Bloomberg survey. Foreign-exchange funds gained 0.08 percent in November, as volatility increased in the currency market, according to Parker Global Strategies LLC. The Parker FX Index, which tracks 63 firms managing more than $33 billion in assets, advanced 4.38 percent last year through November, the Stamford, Connecticut-based firm said in a statement yesterday. Volatility on major currencies doubled to 20 percent by the end of November, from 9.4 percent on July 31, according to an index compiled by JPMorgan Chase & Co. It was at 19.69 percent yesterday. FCPO 3rd month March Futures contract rise RM5 higher to close RM1985 as compare to previous trading session with 17145 lots traded in the market. CPO price was opened higher but trading volatile throughout entire trading session due heavy profit taking activities. 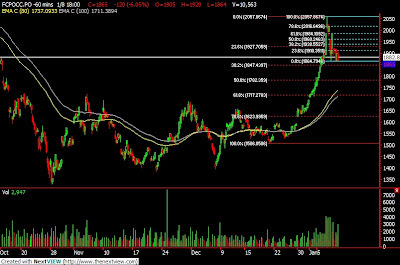 Technically, CPO reach 600% Fibonacci projection figures around RM2060 region and heavy profit taking activities takes place when temporary support levels fails to hold against the selling pressure. We expect CPO price would trade lower towards support levels at RM1900 and RM1850 region in the coming trading session. Traders were advice to long position in the coming trading session provided resistance levels at RM1985 and RM2060 were not violated. FKLI December futures contract closed 6.5 points lower at 921.5 as compare to previous trading session with total 8555 lots traded in the market. FKLI starts plunge tracking close to regional performance due to heavy profit taking activities. Technically, FKLI manage to reach only 38.1% Fibonacci projection figures at 942 region and starts plunge during afternoon session after forms Doji in the hourly chart before morning session ended. We expect FKLI would trade lower in the coming trading session while strong support seen at 914 and 897 region. Traders were advice to hold long position around the support levels while be cautious around the resistance levels at 942 and 957 region. Jan. 7 (Bloomberg) -- Crude oil fell for a second day in New York on forecasts the U.S. economy will worsen, curtailing demand in the world’s biggest energy-consuming country. Oil extended its decline after the U.S. Federal Reserve released minutes of a meeting of policy makers last month that showed they believed “downside risks to the economy would be substantial.” Futures also dropped on speculation that supplies rose last week. Oil for February delivery fell as much as 35 cents, or 0.7 percent, to $48.23 a barrel on the New York Mercantile Exchange, and was at $48.39 at 7:23 a.m. in Singapore. Yesterday futures dropped 23 cents, or 0.5 percent, to $48.58 a barrel. U.S. stockpiles probably rose 900,000 barrels in the week ended Jan. 2, from 318.7 million the week before, according to the median forecast of 10 analysts surveyed by Bloomberg News. Oil rose earlier amid OPEC supply cuts and conflicts between Russia and Ukraine and in the Middle East. Oil rose 38 percent from Dec. 24 to Dec. 5, and traders who bought when oil was cheaper may be selling to collect their profits, triggering sell orders, said Phil Flynn, senior trader at Alaron Trading Corp. in Chicago. Economic growth declined in the third quarter at the fastest rate since 2001 as unemployment rose and home values, housing starts, auto production and consumer spending fell. Analysts downgraded forecasts last month, with economists at Morgan Stanley and JPMorgan Chase & Co. predicting a contraction in gross domestic product of about 6 percent for the fourth quarter, the biggest decline in 26 years. The U.S. Energy Department is scheduled to release its weekly report on inventories of crude oil and fuels at 10:30 a.m. today in Washington. OPEC, supplier of more than 40 percent of the world’s oil, cut output 1.5 percent in December to the lowest in 16 months to counter the first annual drop in prices since 2001, a Bloomberg News survey showed today. Production averaged 30.64 million barrels a day last month, down 475,000 barrels a day from a revised November figure of 31.11 million, according to the survey of oil companies, producers and analysts. Saudi Arabia made most of the cuts. “I think there’s potential for crude oil to rally throughout 2009 in comparable fashion to what it did in 2007, with a similar background of OPEC production cuts driving the market higher,” said Tim Evans, energy analyst with Citi Futures Perspective in New York. Oil prices rose 57 percent in 2007 and fell 54 percent last year. OAO Gazprom cut gas deliveries to Europe through Ukraine to less than one-third of normal, a NAK Naftogaz Ukrainy spokesman said. Russia and Ukraine blamed each other for the cuts as gas shipments from Gazprom through Ukraine plummeted and deliveries to the Balkans were halted. Limited natural-gas supplies to eastern and central Europe from Russia helped fuel a rally to a five-week high in gasoil prices as temperatures across Europe fell to below freezing. Gasoil is the common name for heating oil outside North America. Gasoil for immediate loading in the Amsterdam-Rotterdam- Antwerp area, Europe’s oil-trading hub, rose $46.25, or 10 percent, to $520.25 a metric ton in London yesterday, according to data compiled by Bloomberg. That’s the highest since Nov. 28. Heating oil futures in the U.S., where temperatures are forecast to drop in the Northeast, rose as much as 5.9 percent. Brent crude oil for February settlement rose 91 cents, or 1.8 percent, to $50.53 a barrel on London’s ICE Futures Europe exchange. It was highest close and the first settlement above $50 a barrel since Nov. 28. The conflict between Russia and Ukraine “really reinforces this notion that the West needs to be concerned about the security of energy supplies coming from Russia,” said Addison Armstrong, director of market research for Tradition Energy in Stamford, Connecticut. Jan. 6 (Bloomberg) -- The yen will strengthen another 10 percent, touching 85 against the U.S. dollar for the first time since 1995, before falling in the second half of the year as the global economy stabilizes, Morgan Stanley’s Robert Feldman said. Feldman, head of economic research at Morgan Stanley Japan in Tokyo, said in an interview on Bloomberg Radio that the yen may continue to gain. He remains concerned about how quickly the U.S. economy can recover from the worst recession in 25 years. The yen has been the biggest gainer in 2008, climbing at least 16 percent against all major currencies. The yen benefited as investors unwound carry trades, where investors get funds in a country like Japan with low borrowing costs and buy higher- yielding assets, as about $1 trillion in losses and writedowns from the credit crisis reduced investors’ willingness to buy riskier assets. The yen dropped for a fifth day, declining 1 percent to 94.46 per U.S. dollar at 10:18 a.m. in New York, from 93.44 yesterday. The currency last touched 85 in July 1995. It has slumped 4 percent this year. Feldman said the yen’s real effective exchange rate is not as strong as current market rates may suggest. The rate, a measure of its value against the currencies of 15 of Japan’s trading partners after adjustment for inflation, rose 5.1 percent in December from a month earlier to the highest level since November 2001, the Bank of Japan said today in Tokyo. FCPO 3rd month March Futures contract surge RM143 higher to close RM1980 as compare to previous trading session with 11170 lots traded in the market. CPO price was opened slightly higher and continue to trade higher with high volatility throughout the entire trading session. Technically, CPO today reached 150% Fibonacci projection figures at RM1981 regions after been surge up for 7 consecutive days. We expect CPO would trade higher in the coming trading session while expecting great selling pressure around RM2040 and RM2200 region; both 161.8% and 261.8% Fibonacci projection figures. 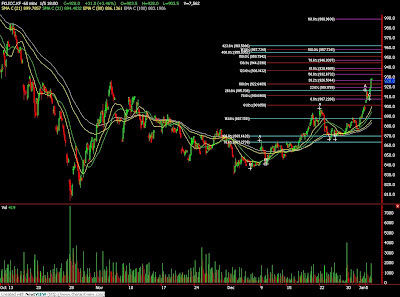 Traders were advice to hold long position in the coming trading session provided if support levels at RM1940 and RM1870 region were not violated. FKLI December futures contract closed unchanged as compare previous trading session to close at 928 with total of 9655 lots traded in the market. FKLI was traded volatile during the trading session as not much fresh market leads to move the market. 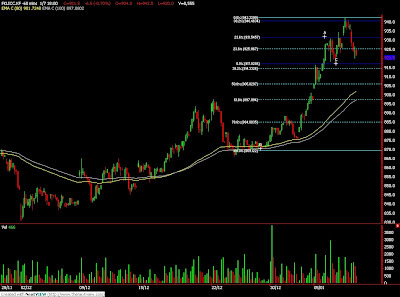 Technically, FKLI manage to reach 250% Fibonacci projection at 931 levels before starts to retrace and rested on 23.6% Fibonacci retracement levels at 917 regions. We expect FKLI would traded higher in the coming trading session while resistance seen at 944 and 957 levels. Traders were advice to hold long position in the coming trading session while support levels were seen at 923 and 917 regions. Jan. 5 (Bloomberg) -- Gold fell the most in two weeks as the dollar rebounded, reducing the appeal of the precious metal as an alternative investment. Silver also sank. The dollar climbed as much as 1.6 percent against a weighted basket of six major currencies, after posting the first monthly decline since June last month. Gold and other precious metals generally move in the opposite direction of the U.S. currency. Gold rose the least since 2004 last year as the dollar advanced for the first time since 2005. Gold futures for February delivery fell $21.70, or 2.5 percent, to $857.80 an ounce on the New York Mercantile Exchange’s Comex division, the biggest one-day drop for a most- active contract since Dec. 19. The metal rose 5.5 percent last year. Silver futures for March delivery dropped 22 cents, or 1.9 percent, to $11.27 an ounce. The most-active contract fell 24 percent last year after seven straight annual gains. The dollar touched a three-week high against the euro on speculation that President-elect Barack Obama’s plan to cut taxes will help the U.S. recover from a recession faster than other countries. The Federal Reserve has slashed its benchmark lending rate close to zero to help stimulate the economy while the European Central Bank’s main interest rate is still at 2.5 percent. “Treasuries and gold are seeing less of a flight to quality,” Lesh said. The U.S. Dollar Index, the weighted basket that includes the euro and yen, slumped 6 percent in December after rising for five straight months. Gold may trade at $800 in one to three months, UBS AG analyst John Reade said today in a report. Before today, gold had rallied for four straight weeks. Investment in the SPDR Gold Trust, the biggest exchange-traded fund backed by bullion, reached a record 780.2 metric tons on Dec. 29. The fund’s assets grew 24 percent last year. Platinum, which fell 38 percent last year as auto sales declined to the lowest in 16 years, may be cheap should government bailouts and tax cuts revive consumer demand for autos, analysts said. About 60 percent of platinum is used in pollution-control devices in cars. Platinum futures for April delivery rose $10.90, or 1.2 percent, to $957.60 an ounce on the Nymex. Palladium futures for March delivery fell $7.35, or 3.8 percent, to $184.95 an ounce. Palladium dropped 50 percent in 2008. Jan. 5 (Bloomberg) -- The steepest plunge in crude prices on record may be setting up oil investors for a rally this year, if history is any guide. The so-called forward curve of futures contracts traded on the New York Mercantile Exchange suggests oil will rise 28 percent to $60.10 a barrel by December. The curve looks almost the same as 10 years ago, after Russia’s default and the collapse of the Long-Term Capital Management LP hedge fund raised concerns that a global economic slowdown would reduce energy demand. Crude prices fell 25 percent in the final quarter of 1998, the steepest drop in seven years. Bets on a recovery paid off then as the Organization of Petroleum Exporting Countries cut production 6.9 percent, causing prices to more than double in 1999. Now, OPEC is pledging to reduce supply 9 percent, companies from Royal Dutch Shell Plc to Valero Corp. are postponing new energy projects and central banks are cutting interest rates to end the worst financial crisis since World War II. Eibl’s Absolute Return Commodity Fund gained 7.5 percent last year in part by betting on agricultural commodities and industrial metals. He beat the Standard & Poor’s GSCI Index of 24 commodities, which dropped 43 percent, and oil, which fell 54 percent. A 30 percent gain this year would be the most since the 57 percent jump in 2007. Traders are already taking advantage of prices in the forward market exceeding those for immediate delivery, a so- called contango. About 26 million barrels of oil may be stored in tankers until later in the year. The crude, valued at $1.2 billion at today’s prices, will be worth $1.57 billion based on December contracts, potentially locking in a profit for investors after expenses for financing, storing and insuring the oil. Crude for February delivery traded at $46.89 a barrel at 9:50 a.m. in London today, compared with $60.10 for the December 2009 contract. At the end of December 1998, oil for February 1999 was at $12.05, compared with $13.78 for December of that year, a difference of 14 percent. Twenty-eight of 30 analysts tracked by Bloomberg forecast higher prices by the end of 2009, with a median fourth-quarter estimate of $70. Adam Sieminski, the chief energy economist at Deutsche Bank AG in Washington, is the most bearish. He said in December that oil will trade at $40 in the fourth quarter, almost 14 percent lower than the Jan. 2 close, data compiled by Bloomberg show. Slowing economies may cut demand by about 700,000 barrels a day this year, he said. “While commodity prices have fallen sharply from their July 2008 peaks, I see a further 15 to 20 percent downside risk for commodities into 2009 and maybe a recovery of those prices only toward the end of the year if there are signals of a global economic recovery,” said New York University Professor Nouriel Roubini, who predicted the global financial crisis. The duration of the slowdown remains the biggest risk to a rebound in raw materials. Japan, the world’s second-biggest economy, may not return to growth until the fourth quarter, while the euro-area will shrink through this year, according to Bloomberg surveys of economists. Oil rallied in 1999 as OPEC reduced output by 1.71 million barrels a day, equal to what is pumped today by Libya, the largest producer in North Africa. The group reduced supplies after Russia’s default in August 1998 sparked concerns about a meltdown in financial markets and Long-Term Capital Management’s $4 billion loss in leveraged trading strategies forced the New York Fed to organize a rescue of the fund by 14 banks and securities firms. Last year was even worse. Commodities prices fell the most in five decades as crude dropped more than $100 from the peak of $147.27 in July. Losses and writedowns at financial firms rose to hundreds of billions of dollars and simultaneous recessions hit the U.S., Europe and Japan for the first time since World War II. The Standard & Poor’s 500 Index tumbled 38 percent and about $29 trillion of global equity market value evaporated. The combination of central banks pumping trillions of dollars into the global financial system and OPEC’s resolve to stop the plunge in crude is making investors more bullish. OPEC is “determined to bring stability to the oil market,” Saudi Oil Minister Ali al-Naimi said Dec. 21 in London, and Saudi Arabia’s King Abdullah said in November that $75 was a fair price. That month his nation cut output by 3.2 percent, the most since April 2006, data compiled by Bloomberg show. OPEC will reduce daily crude shipments by 1 percent in the four weeks to Jan. 17 as the group enacts the supply cuts it agreed in Algeria last month, according to industry consultant Oil Movements. The Federal Reserve cut its benchmark interest rate to as low as zero for the first time and the incoming administration of President-elect Barack Obama will seek as much as $850 billion in new spending and programs, congressional officials have said. China unveiled a 4 trillion-yuan ($585 billion) economic stimulus plan in November and European Union leaders are drawing up packages worth about a combined 200 billion euros ($278 billion). The U.S. economy will shrink 2.4 percent this quarter, following a contraction of 4.35 percent in the three months that just ended, according to economists surveyed by Bloomberg. The world’s biggest oil consumer will contract 0.5 percent in the second quarter before expanding 1.3 percent and 1.8 percent in the next two quarters, the forecasts show. “Once these economies kick in again with the money supply pouring into these economies, everybody is going to be caught short with no inventory of these commodities and then commodity prices will move up again,” said Mark Mobius, executive chairman of Templeton Asset Management Ltd. in Singapore, who oversees about $26 billion in emerging-market stocks. Oil tumbled almost $115 a barrel from its July record. Pump prices for gasoline in the U.S. that peaked at an average $4.165 a gallon are down to $1.67 nationwide, according to the Energy Department. “Low prices in themselves do not normally create demand for commodities but for oil they do,” said Tim Mercer, chief investment manager at Hong Kong-based hedge fund Musahi Capital Ltd. Should the economy recover this year, “$80 to $100 oil is quite possible,” he said. World oil consumption will increase by 400,000 barrels a day, or 0.5 percent, to 86.3 million a day this year, according to the Paris-based International Energy Agency. Oil demand in 2008 fell for the first time since 1983, the IEA estimated. A rebound would reward everyone from Irving, Texas-based Exxon Mobil Corp., the world’s largest publicly traded company, to Saudi Arabia, the biggest producing nation. The Persian Gulf state’s budget drops into a deficit at prices below $50 a barrel, according to Fitch Ratings. Until prices improve, oil companies are delaying investments and shutting plants, threatening to reduce supply further. Shell, based in The Hague, postponed a decision to expand its Athabasca oil-sands project in Canada. Valero Energy, the largest U.S. refiner, said in October it will defer projects to cut spending by about $500 million, or 17 percent. ConocoPhillips agreed to halt bidding for a planned 400,000 barrel-a-day export refinery in Saudi Arabia because of falling prices. The recovery in oil will pace at least a 20 percent return from commodities in 2009, Tiberius’s Eibl said. Futures contracts signal at least a 10 percent appreciation in corn and wheat on the Chicago Board of Trade and a 12 percent gain in cotton. Copper on the London Metal Exchange will lag behind, while gold is likely to end 2009 little changed, futures show. The U.S. Dollar Index traded on ICE futures in New York, which tracks the currency against six others, advanced 6 percent last year, the best performance since 2005. Jan. 5 (Bloomberg) -- Crude oil rose to a five-week high on speculation that the conflict in the Gaza Strip may spread, disrupting oil supplies from other parts of the Middle East, and on signs that OPEC production cuts are being implemented. Oil gained as Israeli warplanes bombarded Palestinian targets and thousands of soldiers moved into Gaza. The Organization of Petroleum Exporting Countries is likely to make all the output cuts promised at its last meeting, causing global stockpiles to fall this quarter, an official from a Persian Gulf member of the group said. Oil for February delivery rose $2.47, or 5.3 percent, to $48.81 a barrel at 2:47 p.m. on the New York Mercantile Exchange, the highest settlement since Dec. 1. Earlier, the contract touched $49.28 a barrel. Prices have rallied 38 percent since Dec. 24. Full implementation of OPEC’s 4.2 million-barrel-a-day reduction in supplies will send inventories below their five-year average, said the official with direct knowledge of OPEC’s deliberations, declining to be identified by name because he isn’t authorized to speak publicly. It’s unlikely the group will convene before its scheduled meeting on March 15, he said. The cutback is from OPEC’s September production levels and includes a reduction that took effect Nov. 1. The group agreed to a record cut of 2.46 million barrels a day at a meeting in Oran, Algeria, on Dec. 17. OPEC produces more than 40 percent of the world’s oil. Morse said the fair-market price for crude was “in the upper $30s or low $40s,” as he anticipates “persistent fundamental weakness” and “persistent commercial stock builds” in January. Crude fell earlier as the U.S. dollar rose to a three-week high against the euro, reducing the appeal of commodities as a hedge. The currency moved on speculation that President-elect Barack Obama’s fiscal stimulus package will help the U.S. economy recover from a recession. Volume in electronic trading on the exchange was 388,081 contracts as of 3:15 p.m. in New York. Volume totaled 303,667 contracts on Jan. 2, down 35 percent from the average over the past 3 months. Saudi Arabian Oil Co., the world’s largest state-owned oil company, raised the official selling prices for shipments of so- called heavy crude grades for February. The company increased the prices for all of its grades to the U.S., according to a statement from its headquarters in Dhahran. Saudi Aramco, as the company is known, increased the price of its Arab Medium and Arab Heavy types to Asia and Europe. The price for its so-called lighter grades was left unchanged or reduced for shipments to Europe and Asia. Venezuelan President Hugo Chavez said today that OPEC countries are “very united” and that Russia, the second-largest oil producer after Saudi Arabia, is working with the 12-member organization in its effort to support prices. Oil climbed 23 percent last week, the most since August 1986, buoyed by the Gaza conflict, a natural gas dispute between Russia and Ukraine, and a rebound in equity prices. Futures tumbled 27 percent the week before. Obama’s economic stimulus package will include hundreds of billions of dollars worth of tax breaks for individuals and businesses, according to a transition official and Democratic aides. Obama is asking that tax cuts make up 40 percent of a stimulus package, the people say. The measure may be worth as much as $775 billion, a Democratic aide said, meaning tax cuts may constitute more than $300 billion of the legislation. The so-called forward curve of futures contracts traded on the Nymex suggests oil will rise 28 percent to $60.10 a barrel by December, according to data compiled by Bloomberg. The curve looks almost the same as 10 years ago, after Russia’s default and the collapse of the Long-Term Capital Management LP hedge fund raised concerns that a global economic slowdown would reduce energy demand. Crude prices fell 25 percent in the final quarter of 1998, the steepest drop in seven years. Brent crude oil for February settlement added $2.71, or 5.8 percent, to $49.62 a barrel on London’s ICE Futures Europe exchange. It touched $50.05 a barrel, the highest since Dec. 1. Jan. 6 (Bloomberg) -- The euro traded near a three-week low against the dollar before a European Union report forecast to show inflation slowed in December, giving the European Central Bank more room to lower interest rates. The greenback also advanced against the Australian and the New Zealand dollars and the Swiss franc on speculation U.S. President-elect Barack Obama’s stimulus package may total as much as $1.3 trillion. The pound fell against the dollar and the euro on bets the Bank of England will lower borrowing costs this week. The euro traded at $1.3629 at 8:37 a.m. in Tokyo from $1.3635 late yesterday in New York, when it touched $1.3547, the lowest level since Dec. 15. The dollar was at 93.26 yen from 93.44 yen. 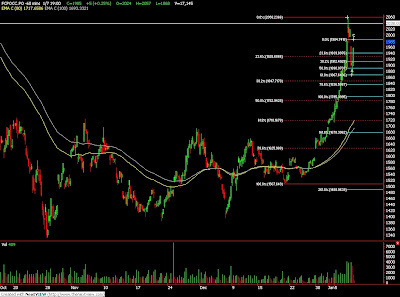 It rose yesterday to 93.60 yen, the highest level since Dec. 8. The euro fell to 127.11 yen from 127.31 yen. The pound fell to $1.4679 from $1.47. The euro may decline to $1.3550 today, Iizuka said. The dollar rose to 1.1097 Swiss francs from 1.1089 francs. Against the Australian dollar, the U.S. currency appreciated to 71.57 cents from 71.73 cents late yesterday in New York. It also advanced to 58.94 cents per New Zealand dollar from 59.06. Inflation in the euro area probably slowed to 1.8 percent last month, according to the median forecast of 28 economists surveyed by Bloomberg News. The report from the European Union’s statistics office in Luxembourg is due today. The rate fell to 2.1 percent in November from 3.2 percent the prior month, the biggest reduction since at least 1991. “Poor economic fundamentals in euroland warrant further rate cuts from the ECB,” said Paresh Upadhyaya, who helps manage $50 billion in currency assets as a senior vice president at Putnam Investments LLC in Boston. “The interest-rate differential is moving in favor of the dollar again.” The euro may fall to $1.30 in three months, said Upadhyaya. The ECB cut interest rates by 1.75 percentage points since early October to 2.5 percent as the euro-zone entered a recession. The ECB’s next policy decision is due on Jan. 15. Obama “has indicated that there’s at least 20 economists that he’s talked with, and all but one of those believe it should be from $800 billion to $1.2 trillion or $1.3 trillion,” Senate Majority Leader Harry Reid said after meeting with the president- elect on Capitol Hill. Obama will take office on Jan. 20. The dollar will advance to $1.10 per euro and 110 yen by year-end, according to Esteve. FKLI December futures contract rose 31 points higher as compare previous trading session to close at 928 with total of 7562 lots traded in the market. FKLI was higher due to Dow Jones overnight strong closing while enhance by strong regional performance. Technically, FKLI continue to surge higher than our expectation at 910 – 914 regions soon after to retrace mildly at 907; 23.6% Fibonacci retracement levels. We expect FKLI would trade higher in the coming trading session while strong resistances were expected around 946 and 957 regions. Traders were advice to take profit around resistances level while only take long position around support levels at 900 and 890 region. FCPO 3rd month March Futures contract surge RM97 higher to close RM1837 as compare to previous trading session with 8292 lots traded in the market. CPO price was opened slightly higher and continue to trade higher with high volatility throughout the entire trading session. Technically, CPO managed to breach the resistance levels at RM1770 and RM1830 regions. We expect CPO would trade higher in the coming trading session with resistance levels seen at RM1930 and RM2000 region. However, traders were advice to hold long position on pull back on traded price. Support levels were seen at RM1700 and RM1760. Jan. 5 (Bloomberg) -- Crude oil rose for a third day in New York after Israeli troops entered the Gaza Strip, escalating the 10-day old conflict and threatening stability in the Middle East, the largest oil-producing region. Oil gained as much as 5 percent after thousands of Israeli troops crossed the border Jan. 3 to capture bases Hamas militants have used to launch rocket attacks on the country. Arab nations and the international community must do more to support Gaza's population, Tehran-based Press TV reported Iran's Foreign Minister Manouchehr Mottaki as saying yesterday. Crude oil for February delivery rose as much as $2.34, or 5.1 percent, to $48.68 a barrel in after-hours electronic trading on the New York Mercantile Exchange. It was at $47.17 a barrel at 11:33 a.m. Singapore time. The contract gained 3.9 percent to $46.34 a barrel on Jan. 2, the highest settlement since Dec. 11. Prices climbed 23 percent last week, the most since August 1986, buoyed by the Gaza conflict, a natural gas dispute between Russia and Ukraine, and a rebound in equity prices. Oil tumbled 27 percent the week before. The Middle East accounts for almost a third of the world's oil production. Prices jumped to a then-record $78.40 a barrel in July 2006 after Israel attacked Iranian-backed Hezbollah forces in Lebanon. Iran is the fourth-largest oil producer. While no production is at risk in the latest conflict, a market reaction is inevitable, even if it's been more than 30 years since war there last cut supplies, National Australia's Burg said. Brent crude oil for February settlement rose $1.81, or 3.8 percent, to $48.71 a barrel on London's ICE Futures Europe exchange. It was at $47.48 a barrel at 11:33 a.m. Singapore time. The contract gained 2.9 percent to settle at $46.91 on Jan. 2. U.S. Secretary of State Condoleezza Rice canceled a planned visit to China this week to monitor events in the Middle East, the State Department said. Israel has resisted international calls for a halt in hostilities, saying it needs to shut down the military wing of Hamas. The Islamic refused to renew a six-month cease-fire that expired on Dec. 19, citing Israel's economic blockade of the province. Oil fell 54 percent last year, the first annual drop since 2001, and the biggest loss since trading started. Prices reached a five-year low of $32.40 on Dec. 19, and had probably fallen too far given the long-term outlook, National Australia's Burg said. The absence of many traders and investors on holidays may have added to the volatility in prices, he said. Crude oil in New York is trading at a discount to Brent as a result of a surge in inventories at Cushing, Oklahoma, said Mitsubishi's Nunan. Storage tanks near the town are the delivery point for futures contracts on the New York Mercantile Exchange. Cushing supplies in the week ended Dec. 26 were at 28.1 million barrels, said the U.S. Energy Department on Dec. 31. That's down slightly from 28.6 million the previous week, the most the Department has ever reported. The surplus of crude may exacerbate the so-called contango structure in oil prices, where futures for prompt delivery are cheaper than those for later, he said. Jan. 5 (Bloomberg) -- Gold advanced for the first time in three days on speculation that escalating geopolitical tensions in the Middle East and higher crude oil will boost the appeal of the precious metal as a haven and a hedge against inflation. Oil gained as much as 5.1 percent after thousands of Israeli troops crossed into the Gaza Strip, escalating a conflict in the Middle East, the largest oil producing region. Troops crossed the border on Jan. 3 in a bid to capture bases Hamas militants have used to launch rocket attacks on the country. “The geopolitical conflict has been supporting crude oil as well as bullion prices,” Tatsuo Kageyama, an analyst at Kanetsu Asset Management Co. in Tokyo, said today by phone. Gold for immediate delivery added as much as 1.1 percent to $884.65 an ounce and traded at $880.65 at 9:45 a.m. in Tokyo. Gold advanced 5.8 percent last year, a record eighth annual advance. Silver for immediate delivery rose 0.9 percent to $11.67 an ounce. The metal fell 23 percent last year, its worst performance since 1984. February-delivery gold gained 0.2 percent to $881 an ounce in after-hours electronic trading on the Comex division of the New York Mercantile Exchange. Crude oil for February delivery rose 2.6 percent to $47.55 a barrel at 9:51 a.m. Tokyo time. The dollar last traded at $1.3952 per euro from $1.3921 late in New York on Jan. 2. December-delivery gold on the Tokyo Commodity Exchange rallied 1.4 percent to 2,609 yen per gram ($881 an ounce) at 9:52 a.m. in Tokyo. December-delivery platinum rose 4.2 percent to 2,762 yen a gram. Immediate-delivery platinum fell 0.9 percent to $938 an ounce. The metal, used in pollution-control devices in cars and trucks, fell 39 percent last year, the steepest drop since at least 1988. Jan. 5 (Bloomberg) -- Palm oil futures in Kuala Lumpur rose a sixth day after Malaysian exports advanced last month, likely lowering record stockpiles. Shipments from Malaysia, the second-largest producer of the vegetable oil, climbed 25 percent to 1.65 million metric tons in December from November, surveyor Intertek said Jan. 2. It was the largest gain in three months. “Inventories are being cleared as exports are strong, and this is supportive of prices,” said Ben Santoso, a plantation analyst at DBS Vickers Securities in Singapore, by phone today. March-delivery palm oil rose as much as 3.2 percent to 1,795 ringgit ($516) a metric ton on the Malaysia Derivatives Exchange in Kuala Lumpur. It paused at 1,780 ringgit a ton at the 12:30 p.m. trading break. India, the second-largest user of palm oil, may increase imports because it’s cheaper to import the commodity duty-free compared with rival soybean oil with a 20 percent customs tax, Santoso said. The nation bought 519,032 tons of cooking oil in November, 49 percent more from a year earlier, the Solvent Extractors’ Association said last month. Crude palm oil imports gained 16 percent to 363,578 tons, and purchases of refined, bleached and deodorized (RBD) palmolein totaled 137,959 tons, up from 30,014 tons a year earlier. India relies on imports to meet almost half its edible-oil demand. Most of it is palm oil from Indonesia and Malaysia, and the rest is soybean oil imported from Argentina and Brazil. Palm oil stockpiles in Malaysia climbed to a record 2.27 million tons in November, according to the Malaysian Palm Oil Board. December numbers are due next week. Jan. 5 (Bloomberg) -- The dollar, yen and Swiss franc may weaken this year against 2008’s biggest losers in the currency markets as the global economy starts to recover, the largest foreign-exchange strategists and investors say. The winners will be the Brazilian real, Indonesian rupiah and Polish zloty as investors return to higher-yielding assets, according to Bloomberg News surveys. The dollar may strengthen versus the euro and Japanese yen, while dropping against the British pound. While the International Monetary Fund cut its 2009 growth forecast for the world economy to 2.2 percent in November from 3.9 percent, investors are growing more confident as central banks lower interest rates and governments earmark trillions of dollars for fiscal stimulus. The Dollar Index that tracks the currency against six of the U.S.’s biggest trading partners fell 6 percent last month, the most since July 1985, after rising 18 percent from June to the end of November. The dollar lost steam as the Federal Reserve cut its target rate for overnight loans between banks to as low as zero and poured $8.5 trillion into the financial system. Treasury yields fell to records last year and rates on bills dropped below zero last month for the first time as investors sought the safety of government debt. Faster economic growth will cause the dollar to weaken to 2.30 against the real from 2.3145 at the end of 2008, according to the strategist surveys. The rupiah may follow, gaining 11 percent against the dollar to 9,850 by the end of 2010, while Poland’s zloty strengthens 13 percent to 2.62 in two years, the surveys show. The pound may strengthen 3.5 percent to $1.51 this year, while the euro will depreciate 8.4 percent to $1.28, the strategists said. The yen, last year’s best-performing major currency, will lose 10 percent to 100 yen, they said. Lawrence Goodman, head of emerging market currency strategy at Bank of America Corp. in New York, says countries that prove better at withstanding the global slowdown should benefit as the flight to safety slows. The dollar will decline 18 percent against the real and 19.5 percent versus the zloty, he said. Investors see little need to hold dollar assets as the Fed floods the world with greenbacks, the U.S. budget deficit swells to more than $1 trillion and with the trade gap exceeding $57 billion. China cut the share of dollars in its $1.9 trillion of reserves to about 45 percent last year from more than 70 percent in 2003, Deutsche Bank AG in Frankfurt estimates. U.S. efforts to fix the financial system and the stimulus package promised by President-elect Barack Obama may still support the dollar by helping the world’s biggest economy recover faster than Europe and Japan. Japan’s economy will probably shrink at an annual 12.1 percent pace this quarter, the sharpest drop since 1974, after reports showed industrial production and exports posted the biggest declines on record in November, Kyohei Morita, chief Japan economist at Barclays Capital in Tokyo, said last week. By the end of 2009, the U.S. economy will be growing at a 1.8 percent annual pace, while the euro zone will be shrinking at a 0.4 percent rate and Japan will be expanding 0.4 percent, according to Bloomberg surveys. Deutsche Bank, the world’s biggest currency trader, is among the most bullish on the dollar, forecasting a rally to $1.20 versus the euro, and to $1.30 against the pound, as the European Central Bank cuts its target rate to 0.75 percent this year from 2.5 percent, and the Bank of England lowers its benchmark to 0.5 percent from 2 percent. Bank of England policy makers meet Jan. 8 and are likely to lower their target rate to 1.5 percent, according to the median estimate of 50 economists surveyed by Bloomberg. The ECB meets Jan. 15 to set borrowing costs. The U.S. economy will grow 1.6 percent in 2010 after contracting 2 percent this year, while the 16-member euro zone shrinks 2.5 percent in 2009 and expands 1 percent the next, according to Deutsche Bank. Treasuries due in 10 years will yield 50 basis points, or 0.5 percentage point, more than comparable German bunds by year-end, instead of about 75 basis points less currently, the bank predicts. By year-end, the dollar will trade at $1.30 against the euro, and at 100 yen, Chandler said. He predicts it will trade at $1.42 per pound. The dollar rose to 91.97 yen as of 12:28 p.m. in Tokyo from 91.83 yen late in New York on Jan. 2, when it reached 92.42 yen, the highest level since Dec. 11. Against the euro, the dollar climbed to $1.3863 from $1.3921. Selling the dollar in 2008 was a losing bet, as the Dollar Index gained 6 percent to 81.308, its first annual increase since rising 13 percent in 2005. The yen and franc also benefited from investors getting out of risky assets, with Japan’s currency appreciating 19 percent and Switzerland’s strengthening 5.7 percent versus the dollar. The greenback’s share of foreign reserves rose in the third quarter to 64.6 percent from 63 percent at the end of June, the Washington-based IMF said Dec. 31, the biggest increase since the first three months of 2004. Investors bought the dollar to purchase Treasuries and shield their money from credit-related losses and stock declines that wiped out more than $28 trillion from equity markets. Writedowns and losses at the world’s largest financial institutions since the start of 2007 total $1 trillion, according to data compiled by Bloomberg. The biggest beneficiary was the yen, as the retreat from risk caused investors to unwind carry trades and buy back the Japanese currency that financed purchases of higher-yielding assets. The search for higher yields may trigger demand for the Australian and New Zealand dollars as money managers take advantage of central bank rates more than 4 percentage points higher than in Japan. The Australian dollar, which weakened 20 percent against the U.S. dollar last year, depreciated 35 percent in 2008 to 63.67 yen. New Zealand’s dollar fell 39 percent to 52.53 yen. Emerging markets were among the biggest losers last year as the MSCI EM Index fell 54.5 percent. “If the governments are successful turning the economy, ironically, that will come along with a very weaker dollar,” said Chirag Gandhi, a money manager of a $2.5 billion global fixed income fund at the Investment Board of State of Wisconsin in Madison, Wisconsin. Developing economies will grow 3.1 percent in 2009, following a 5.9 percent gain last year, while developed countries, including the U.S., the euro area and Japan, will contract 1.4 percent after expanding 0.9 percent in 2008, the Institute of International Finance said in its forecast released Dec. 18 in Washington. The group represents the world’s largest commercial and investment banks. The currencies of Poland, Brazil and Indonesia will be among the best performers, Bank of America’s Goodman said. The zloty will strengthen to 2.39 per dollar by the end of June after dropping 21 percent. The real will surge to 1.90 after plummeting 30 percent and the rupiah will trade at 10,000 by the end of September, Goodman wrote. Emerging-market bonds are starting to draw investors. The extra yield they demand to own the debt instead of Treasuries fell to 6.94 percentage points from 8.62 percentage points in October, according to JPMorgan’s EMBI+ Index. FCPO February futures contract surge RM45 higher compare to previous trading session and close at RM1740 with a total 5382 lots traded in the market. CPO price was traded higher due to crude oil and soybean strong overnight closing. 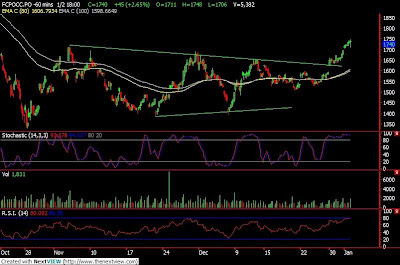 Technically, CPO price was traded higher after breach the resistance trend line at RM1640. However, based on the RSI and Stochastic hourly chart shows some overbought activities. We expect some mild retracement for CPO price in the coming trading session around support at RM1660 and RM1600 region. However, traders were advice to hold long position in the coming trading session. Resistances were seen at RM1770 and RM1820 region. FKLI December contract surge 18 points higher at 897 as compare with previous trading session with a total of 4924 lots traded in the market. FKLI opened higher and continue it’s momentum to trade higher throughout entire trading session. Technically, FKLI seems trading strong on the upside in the hourly chart. 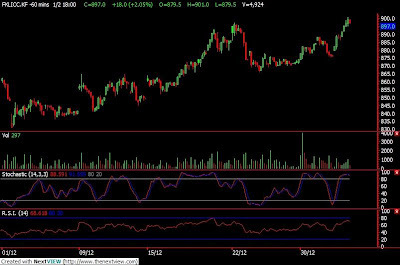 However, FKLI seems completed 61.8% at 901 levels while RSI and Stochastic shows FKLI was traded on the top side. We expect FKLI would have some profit taking activities in the coming trading session with support seen at 888 and 875 regions. Traders were advice to take profit around the resistance levels at 910 and 927 in the coming trading session and take long position around the support region. Jan. 2 (Bloomberg) -- OPEC will cut daily shipments of crude oil by 1 percent in the four weeks to Jan. 17 as the group enacts supply reductions announced in the past four months, according to industry consultant Oil Movements. The Organization of Petroleum Exporting Countries, producer of more than 40 percent of the world’s oil, will load 23.75 million barrels a day in the four-week period, down from 24 million in the four weeks to Dec. 20, Oil Movements said. OPEC last month announced a record supply cut of 14 percent after curbs agreed on in September and October failed to stop prices falling among a worldwide decrease in demand. The group has implemented about half of the cuts it pledged in September and October, according to Oil Movements. Shipments from the Middle East will decline 1.2 percent to 16.96 million barrels a day in the period to Jan. 17, Oil Movements said. A total of 419.34 million barrels of crude will be on board tankers on Jan. 17, a decline of 8.9 percent from the month before, when 460.14 million barrels were being shipped. Oil Movements combines reports from shipbrokers on tanker rentals with its own mathematical models to calculate how much crude is being shipped. OPEC has completed about 1.2 million barrels a day of the 2-million barrel a day in supply cuts announced in September and October, Mason said. It has yet to begin the additional 2.2- million barrel a day reduction agreed on Dec. 17 in Algeria, he said. Jan. 2 (Bloomberg) -- Gold fell as the dollar climbed against the euro, eroding the appeal of the precious metal as an alternative investment. Silver and platinum futures rose. The euro slid after a report on European manufacturing indicated the recession is deepening in the 16-nation region, signaling that the European Central Bank may cut borrowing costs to stimulate the economy. Gold and other commodities often move in the opposite direction of the dollar. In 2008, gold gained 5.5 percent, the smallest increase since 2004, as the dollar climbed for the first time in three years against the euro. “The dollar is a little stronger, which was an additional weight that gold is fighting against,” said Frank McGhee, the head dealer at Integrated Brokerage Services LLC in Chicago. Gold futures for February delivery dropped $4.80, or 0.5 percent, to $879.50 an ounce on the Comex division of New York Mercantile Exchange. The metal still climbed almost 1 percent this week. The ECB’s benchmark interest rate is 2.5 percent, while the U.S. federal-funds rate is zero to 0.25 percent. Simultaneous recessions in the U.S., Japan and Europe have forced central banks worldwide to cut borrowing costs to stimulate growth. Gold followed fluctuations in energy costs. The metal pared losses as crude oil jumped as much as 4.8 percent following an 8 percent drop. Tensions mounted in the Middle East between Israel and Iran-backed Hamas. Israeli warplanes and naval vessels hit more than 20 targets in Gaza overnight, including a mosque and a refugee camp that the country claimed was being used to store weapons. Still, a global recession may damp demand for the precious metal. Gold imports by India, the world’s biggest buyer, fell for a second straight month in December, according to the Bombay Bullion Association Ltd. Purchases fell to about 3 metric tons from 16 tons a year earlier, the group of traders reported. Silver, platinum and palladium, which all had annual losses in 2008, gained as a rally in equities heightened speculation that demand for industrial metals will rebound. Silver futures for March delivery rose 19.5 cents, or 1.7 percent, to $11.49 an ounce. This week, the price gained 9.1 percent, the most since mid-September. The metal dropped 24 percent in 2008. Platinum futures for April delivery climbed $5.20, or 0.6 percent, to $946.70 an ounce on the Nymex. The price climbed 5.8 percent this week. Palladium futures for March delivery rose $3.60, or 1.9 percent, to $192.30 an ounce. This week, the price jumped 9.3 percent, the most since early November. Palladium plunged 50 percent in 2008, while platinum declined 38 percent. The Standard & Poor’s 500 Index climbed as much as 2.6 percent today. Jan. 2 (Bloomberg) -- Crude oil rose, capping the biggest weekly gain since 1986, as the conflict in Gaza increased concern that Middle East supplies would be cut and Russia curbed natural- gas shipments to Ukraine. Israeli warplanes conducted fresh attacks against Hamas on the seventh day of a bombing campaign in the Gaza Strip, raising the prospect of violence in the region, source of one-third of the world’s oil. Russia’s dispute with Ukraine over natural-gas prices deepened after no new talks were scheduled. Oil futures have traded in a range of more than $5 a barrel today. Crude oil for February delivery rose $1.74, or 3.9 percent, to $46.34 a barrel at 2:52 p.m. on the New York Mercantile Exchange, the highest settlement since Dec. 11. Prices climbed 23 percent this week, the most since August 1986. Oil prices tumbled 27 percent in the week ended Dec. 19, the biggest decline since trading began in 1983. Oil fell 54 percent last year, the first annual drop since 2001 when crude slipped 26 percent, and the biggest loss since trading started. Israel struck at least 35 targets in the Gaza Strip and Hamas militants launched more rockets today as hopes for a truce dimmed. Oil surged in 1974, helping spur a recession in the developed world, after an oil embargo that followed the Arab- Israeli war in October 1973. OAO Gazprom boosted gas supplies to Europe through Belarus, avoiding Ukrainian pipelines. Talks between the two sides on the price of gas deliveries to Ukraine for 2009 and transit fees for Russian gas to Europe through the country broke down on Dec. 31, and Gazprom cut supplies of the fuel to Ukraine yesterday. Agricultural futures also rose and equities rallied on speculation that government stimulus efforts will curtail the recession. The Dow Jones Industrial Average increased 258.3 points, or 2.9 percent, to 9,034.69. The Standard & Poor’s 500 Index rose 28.54 points, or 3.2 percent, to 931.79. Commodity prices may be more volatile this week because many traders are taking time off for the New Year’s holiday. Volume in electronic trading on the exchange was 255,932 contracts as of 3:10 p.m. in New York. Volume totaled 357,359 contracts on Dec. 31, down 24 percent from the average over the past 3 months. Oil may rebound this year to average $60 a barrel as the Organization of Petroleum Exporting Countries makes record production cuts to counter the deepest economic slump since World War II, according to the median of estimates by 33 analysts surveyed by Bloomberg News. That would be a 29 percent gain from today’s price. OPEC will cut daily shipments of crude oil by 1 percent in the four weeks to Jan. 17 as the group enacts supply reductions, according to industry consultant Oil Movements. Members will load 23.75 million barrels a day in the period, down from 24 million in the four weeks ended Dec. 20, the Halifax, England-based company that tracks oil shipments said. Brent crude oil for February settlement climbed $1.32, or 2.9 percent, to settle at $46.91 a barrel on London’s ICE Futures Europe exchange. The Houston Ship Channel, which serves the largest U.S. petroleum port, is closed to tankers and other large vessels because of fog at the mouth of Galveston Bay, the U.S. Coast Guard said. Pilots who guide vessels stopped operations at 10:05 p.m. local time yesterday for safety reasons, Coast Guard spokesman Martin Montes said today in a telephone interview. The area’s eight refineries have a combined processing capacity of 2.22 million barrels a day, which represents 13 percent of the U.S. total, according to their owners and the National Petrochemical and Refiners Association. “The closure of the Houston Ship Channel at the end of this week is a sign that we will see a drop in crude-oil supplies in next week’s inventory report,” Strategic Energy’s Lynch said. The Energy Departments will release its weekly petroleum supply report at 10:30 a.m. in Washington on Jan. 7. Gasoline futures for February delivery climbed 4.85 cents, or 4.6 percent, to $1.1105 a gallon in New York. Heating oil for February delivery increased 3.82 cents, or 2.6 percent, to $1.4803 a gallon. Regular gasoline at the pump, averaged nationwide, rose 0.8 cent to $1.626 a gallon, AAA, the largest U.S. motorist organization, said on its Web site today. The fuel has dropped 60 percent from the record $4.114 a gallon reached on July 17.